Is it true that when a girl wants to change something in her life, she starts with her hair?Â To me it is!Â Some of my friends celebrate a semestral break vacation with a new hair cut.Â Others want a new hair do after a break-up.Â Whatever it is, we girls feel that our hair is a big deal and going to a Salon is a therapy for all of us.Â We feel more confident if we look good and the hair contributes a lot to how we look. Â That’s why, going to a salon I trust is very important! My usual trip to a hair salon is traumatizing.Â I am not a hair expert myself so I wouldnâ€™t know which styles are best for my face.Â Itâ€™s always a dilemma expecting to see a beautiful changeÂ then all of a sudden, the hair stylist screws up.Â Thatâ€™s why I am very keen in choosing the right parlor for me. Oh well, I have a new discovery folks! Vince and I went to Vivere Salon to get our haircut together Their tagline is â€œWe just donâ€™t cut, we DESIGN your hair!â€ True enough girls, I went inside not knowing what to do with my hair.Â All I know is that I have my own hair problems. My problem with my hair is obvious. (1) Uneven color!!! YIKES!!! Look at that ugliness. (2) My hair looks boring! It needs a new hair style! The head stylist examined my hair.Â I just told him to surprise me. I just wanted to be more beautiful and less boring. And so he did say that he needed to re-color my hair (obviously) with some treatment and a stylish layered do for my naturally thin hair to give it a more bouncy feel (even without blow dry). The washing partâ€¦ They always massage my scalp everytime they rinse my hair. Ohâ€¦ and they also massaged my backâ€¦ It was the best back massage ever.. I almost slept! A guy massaged me.Â A real manâ€¦ Iâ€™m starting to think Iâ€™d get a male masseuse on my next spa time lol. This part is almost done, itâ€™s just time to cut the hair! Look at the head stylist Mr. Leo! He looks intense manâ€¦ Heâ€™s definitely determined to make me more purrty! Heâ€™s at the Vivere Salon at Robinsonâ€™s Place Ermita so if you donâ€™t have a clue what to do with your hair, let him handle it. Ta-da!!! I forgot to ask what color because I was just too excited! I was so happy!!! Look at the shine and the color!Â At this point, my hair is still half wet! and of course, posing inside malls is no biggieâ€¦ Iâ€™m a blogger, itâ€™s my right! I would like to give all my thanks to Bea Chua who hooked us up with wonderful Vivere Salon It was a great beauty discovery for me!Â Also thanking our stylists Leo Antifino and Peng Guevarra for our make-over! 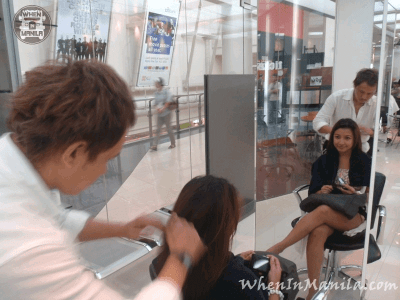 Do check out Vivere Salon at the different locations below! I’m a fan 🙂 Especially that I don’t know what to do with my hair 🙂 I’m so happy they know better what looks good on me 🙂 Thanks Bea! you baited me- hook, line and sinker!! it was your great feedback that made me try the services of Vivere in Ermita. I was so excited to look my best for our forthcoming reunion that I didn’t bother to ask for prices. it was broad day-time hold up!!! i paid 13+k for a bob haicut and a color and treatment for my friend whom I treated out. the massage I was looking forward to didn’t happen. with this bill I paid, i wasn’t even issued a receipt. I was just so shocked with the sky rocket bill, I completely forgot to ask. hope next time, they should consider asking their customer first, if the price for their services is okay for them. hi, how much did you spend to your hair color with hair cut?thanks you look more beautiful.